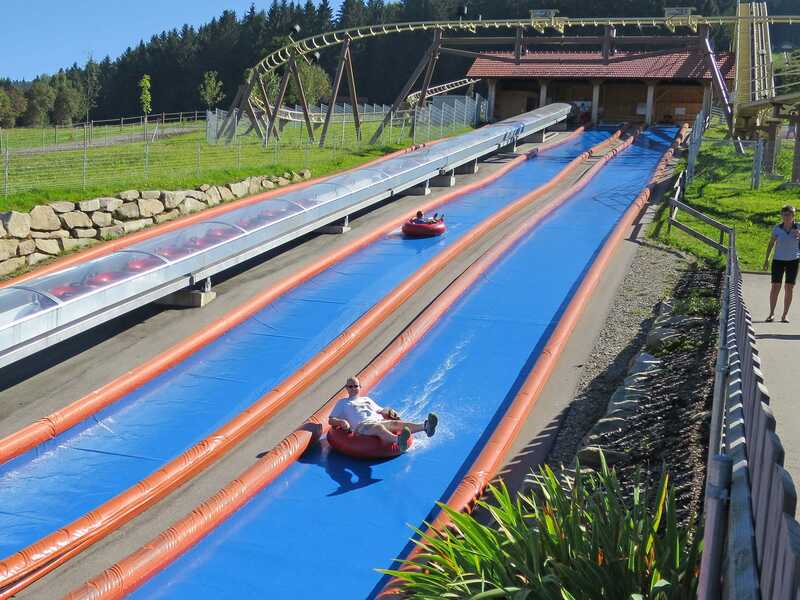 Rodel und Freizeitparadies Sankt Englmar is an adventure park located in the mountains roughly one hundred kilometres north-east of Munich and twenty kilometres from the Czech Republic. The place is home to an alpine coaster, an alpine slide, bumper boats, tube slides, and a handful of self-operated attractions. 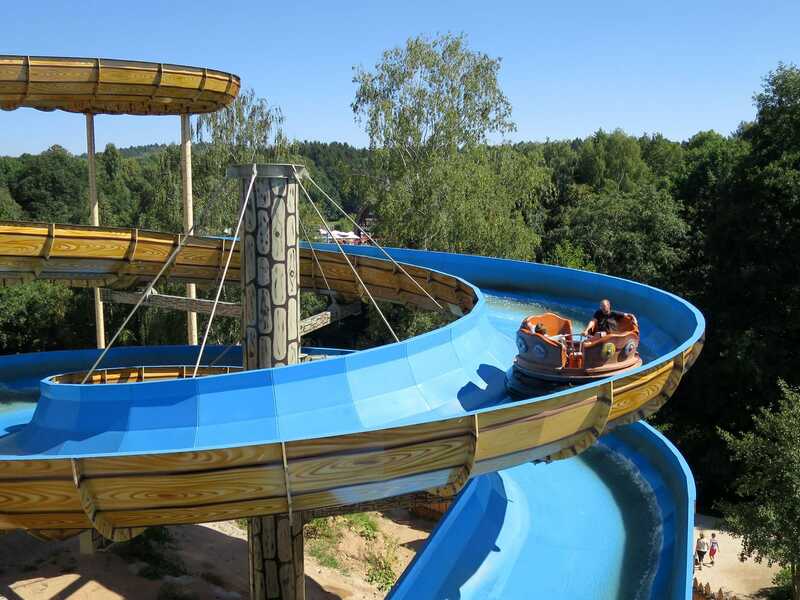 The park decided to celebrate its twentieth anniversary this year with the introduction of a roller coaster from local manufacturer Zierer, located just thirty kilometres away in nearby Deggendorf. Voglwuide Sepp (#2292) has a somewhat unusual beginning made up of three consecutive lift hills. The first is a tyre drive leading to a ninety degree turn, followed in short order by a second with a chain that lifts the five car trains to a maximum height of nine metres above the ground. A fairly pointless drop of around six metres then leads to a third lift with a similar maximum height, making me wonder why the designers didn't just go with one larger lift hill. Regardless as to the reasoning, the sloped terrain and three lifts combine to give a respectable twenty-seven metre height differential which provides enough potential energy for the five car trains to traverse a winding seven hundred and fifty metre course back to the station. The layout feels very much like it was originally designed as an alpine coaster, with a series of low to the ground turns punctuated by occasional gentle climbs where the track crosses over itself. The finished course could not be negotiated by standard single seater sleds, as it would be too easy to valley, but I rather suspect that they'd manage without issue if the ability to brake was taken away. The result is a respectable family coaster, albeit not one that I'd go out of my way to return to, and the reader can interpolate quite a bit from the fact that we didn't bother buying tickets for a second lap. Our second stop was on Bayerwald-Coaster, a respectable design from Wiegand without annoying automatic braking. The descent followed a fairly typical layout, though it was punctuated by a few drops that seemed somewhat steeper than the norm. We followed this up with Bayerwald-Bob, a trough slide where I'm slightly ashamed to say I had no choice but to brake in order to avoid an embarrassing wipeout. Megan was able to go full speed until she caught up with me, though I'm guessing that her lower weight probably helped there. There is a footpath that runs up the side of the mountain next to all three rides, and while climbing it requires a lot of energy I'd nevertheless encourage all those with even a passing interest in photography to make the effort, as there is an excellent shot of the coaster and the surrounding area from the peak. On the way back down Megan decided to try Bayerwald-Racer, a seventy metre long water slide traversed by rubber tubes, albeit of the sealed kind to ameliorate the risk of an embarrassing wet patch. I initially decided to give it a miss but changed my mind, and I'm glad that I did; it was surprisingly good fun. We decided to break our drive with another pathetic kiddie coaster located in the High Arch mountain range in the Bavarian Forest. Butterfly (#2293) required a €1.50 token which Megan went to obtain from a nearby shop. The chain lift engagement on this model was rather startling, to put it mildly, but otherwise the experience was as expected. There was a reasonably lengthy alpine slide available next door to the coaster, but getting to it would have required a cable car journey, and we decided to give it a miss in favour of more time at our third stop. It was early afternoon when we arrived at Freizeitpark Plohn. The spacious entrance area from my last visit to the park in 2009 had been closed off in favour of a new ticket building that today was populated by a single dour female in her fifties. My attempt to pay using card was rebuffed with a shake of the head and some gesticulations indicating that the only form of acceptable payment was cash. There was no ATM available on site, setting us up for potential embarrassment, but by pure luck I had enough on hand to purchase two tickets leaving me with a small quantity of shrapnel for incidentals. This gruff first interaction set the tone for the visit as a whole; though we had an enjoyable stay I'd argue that it was in spite of (rather than thanks to) the best efforts of the park staff, who almost without exception gave off a distinctly unfriendly vibe. We decided to begin our explorations with Fluch des Teutates, a spinning rapids from ABC Engineering introduced in 2013. From ground level the ride looked much the same as the portable designs from Fabbri and Reverchon, but the experience could not have been more different; from the moment the boat entered the trough it began to spin rapidly, and within seconds the surrounding environs became a blur as we got faster and faster. It was impossible to tell what point of the course we were in as the centrifugal forces pinned us into our seats, causing uncontrollable fits of giggling. When we eventually reached the end the boat landed in the water with only the slightest of splashes, and the ensuing minute long float back to the station gave us an entirely necessary minute to regain full equilibrium. Our second stop was at Plohnidorf, a beautifully themed children's village centered around an antique carousel added to the park for the 2011 season. Nostalgie-Pferdekarussell was built in 1969 by Zierer for local showman Rudolf Krick, who toured it all over Germany over a period of thirteen years. It was subsequently installed at Heide Park, where it operated from 1993-2008 on an island in the lake close to the park entrance. It went through an extended refurbishment before reopening at Plohn, and the craftsmen who worked on it did a superb job; today it looked wonderful, and the comparison against the modern equivalent at my local park could not have been more pronounced. One whole side of the new area is devoted to Plohseidon (#2294), a Zierer Force 190 that was essentially a duplicate of the family coasters at the Busch Gardens parks in Tampa and Williamsburg. The only difference was an extended flat section of track between the station and lift hill where the train passed some theming, aided by three sets of tyre drive motors operating at a speed of around five miles per hour. The experience was an entirely typical family coaster whose brevity was compensated for by the simple expedient of giving everyone a second lap. We took the first available seats rather than wait for front or back, as we figured that it wouldn't make a huge amount of difference. We followed this up with what for ease of description I'm going to refer to a dark ride. Plohni's Tauchfahrt, or Plohni's Cruise, featured a four car train that made two laps of an oval shaped track past a variety of underwater scenes lit in assorted shades of blue and purple. The queuing area featured an elaborately themed classroom full of animatronic elves sitting at old fashioned school desks, though I'm very unclear about what connection these had with the actual ride. Though obviously geared at children the seats were more than large enough for adults, to the point that Megan and I were able to share one car. I'd been rather looking forward to renewing my acquaintance with El Toro some seven years after I described it as the best wooden coaster in Germany by a huge margin. The competition back then was limited to just three rides, allowing any half decent effort to rise to the top of the pile. The tracking today was respectable enough, apart from the first and last turns which were in need of attention, though the overall experience didn't wow me in the way that it had once done. There was floating airtime to be had, particularly when seated towards the front of the train, but only on some of the hills; others were traversed with no perceptible forces, making the experience feel weak in comparison to other European GCIs. Our next stop was at Miniwah, which premiered in 2015 as the first new European installation of the Mack Powered Coaster since Dynamite Express eleven years before. Though nominally a custom design, the on-board experience is quite similar to the standard Blauer Enzian, albeit with an operational difference: on this ride guests are given one slow lap to observe some hugely detailed scenery, followed by two at full speed. The decision to use powered coaster hardware for an immersive dark ride experience constitutes a stroke of genius, and in hindsight it seems almost amazing that this was only tried for the first time in 2014. Our sole lap was in the back row, though as with the family coaster earlier it seems unlikely that there's a huge amount of difference between locations. 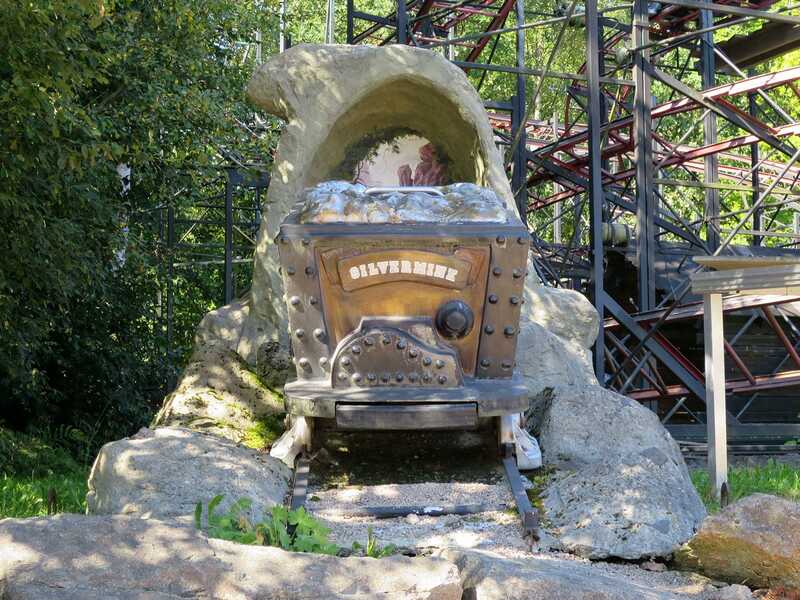 The oldest coaster in the park at this point is Silver Mine, a Zierer Flitzer that began its career in 1975 at Adventureland Iowa. Today the four decade old ride felt like it was on borrowed time, as our car failed to engage the lift hill on its first attempt and rolled back perhaps three feet before catching. The initial drop and climb out was decent enough, but the block brakes from that point forward were being used as trims, resulting in a sluggishness to the layout that I don't remember from the other installations. It was tempting to ride a second time to gather more data for our respective trip reports, but we decided to abstain as we had other areas of the park to explore. We joined a large group of adults in the queue for Raupe, a Wacky Worm that debuted in 2005 as the first ride of its type in Germany. There were at least twenty people there, split fairly evenly between males and females, and none of them appeared to have cameras, rendering it unlikely that they were coaster enthusiasts. Instead they were just random visitors reliving their youth by having fun in a park, something that has become increasingly difficult to do in a world where adults without children are routinely discriminated against. With the credits out of the way we made our way to the Oldtimerfahrt antique cars, supplied by local manufacturer Metallbau Emmeln. The track followed a C-shaped routing past a number of fiberglass frogs in a variety of different poses, including one on a bicycle, one relaxing on a sun lounger, one sitting on top of a heated saucepan, and, for the authentic local effect, one dressed in lederhosen with a cigarette in his mouth. There were a few other token amphibians along the path too, including a turtle with a grumpy facial expression who appeared to have had a recent encounter with yellow spray paint. We found Deutschlands Größtes Baumhaus (Germany's Largest Treehouse) at the back of the park, where it was linked closely with a pyramid-shaped slide, a few party tricks that would not have been out of place in a ghost train, and a number of fun house attractions. The most entertaining was a spinning disc on the floor that was rotating at double the normal rate, to the point that neither of us managed to keep our balance while standing on it for more than a few seconds. The nearby handrail was perfectly adequate, though readers attempting to retrace our stumbling would do well to be careful; the force of my collision with it generated an impressive bruise that was bright purple a few days later. There was one whole section of the park we'd yet to explore, and we found that it contained a whole series of moving dioramas featuring scenes from well-known fairy tales. 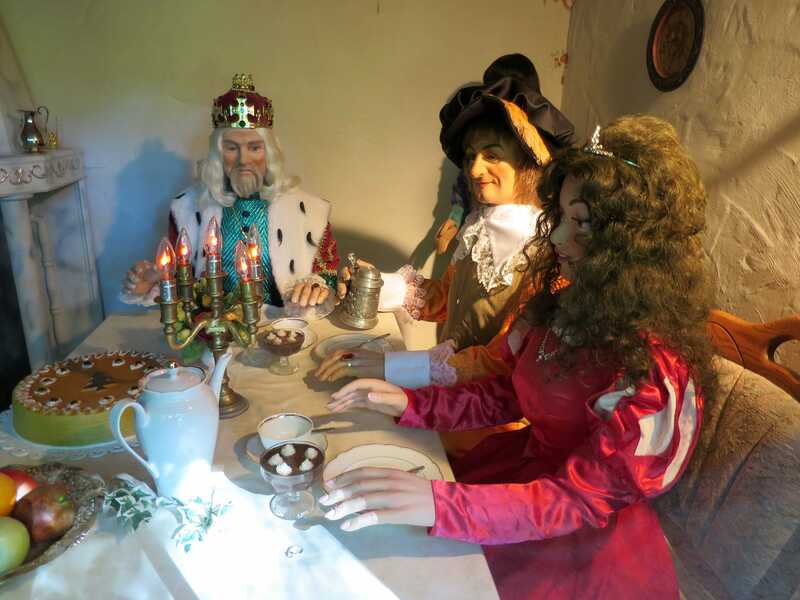 The section also contained a handful of small carousels, including one with a dozen fine horses set on the second floor of Rapunzelschloss. This machine was particularly ornate, and I discovered later on that it had been one of the very first attractions in the park, dating back to the grand opening in 1996. We thought we'd covered everything at this point and were about to reverse course when we spotted an unassuming footpath with no signage leading through some trees and out of sight. Following it brought us to Floßfahrt durch die Urzeit, which despite its name was not in fact an exhibit of flatulent dental hygiene equipment. Instead it was a ten minute long cable-driven raft ride past a collection of animatronic dinosaurs, troglodytes, and other prehistoric species. There was a family sized rotating freefall next to it that it would have been nice to try, but the queue was at least thirty minutes long, and we decided that the time would be better spent enjoying three final laps on El Toro.